It’s the 30th anniversary of Marc Bolans death today. Down in Barnes, just over the crest of the bridge, there’s a day-long fan tribute centred around the tree his Mini crashed into. This is an old post, that somehow got lost in the archives here at Strangeharvest, which seems appropriate to dust down today. It’s one of those incidental London landmarks … just where you hump the bridge over the train tracks at Barnes station as you head from Putney Common to the South Circular. This is the spot where Marc Bolans mini skidded off the road and smashed into a big tree leaving a crumpled mess of glamourous rock star, hip design icon and nature. Blood, sap and oil dripping into the suburban soil like an infusion of the purest liquid glamour. A quarter of a century later, there’s a mini statue half way down the bank and what looks like a parish notice board facing the killer tree. The board and the tree are decorated with the most charming and heartfelt amateur tributes. Messages to Marc in copywrite free fonts and clip art motifs printed out of bedroom inkjet printers. This fluttering A4 foliage is an explosion of amateur graphic design. 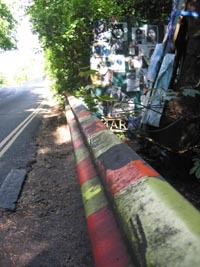 Below this is a crash barrier that was most likely installed post crash by a guilty feeling traffic engineer to stem his teenage daughters tears. This generic crash barrier has been painted up to make it extra safe in day-glo pink and yellow. This isn’t a standard colour scheme, its a fan tribute safety system that has been hand painted on. It’s dumpy, gormless, ordinary infrastructure dolled up like a seventies Top of the Pops teenager. A tribute through improved road safety that transforms the glam rock lip gloss and eyeliner look into an urban intervention. An alternative kind of monumentalism: Tragedy, beauty, make up and roadmarkings confused into a brand new kind of popular, helpful and touching urban monument.